The way garage doors are constructed often determines their longevity. Some materials are more susceptible to the elements than others, which is why they must be chosen depending on the local weather conditions in your area. Nowadays, there are cost-effective doors which actually need less maintenance. These can be an excellent solution for many homes, but garage door maintenance is still considered the number one determinant for long-lasting systems. This routine service can help you avoid a lot of major problems and will increase the lifespan of your door by a significant margin. The benefits of regular garage door maintenance are plenty. The entire system works better afterward, lasts longer than expected, makes less noise, and offers the proper protection and convenience. Our experts achieve this by inspecting every part of the system, from the panels to the weather stripping and the tracks, and apply the appropriate repairs to any minor issue they discover. There is a lot that goes into a maintenance appointment. 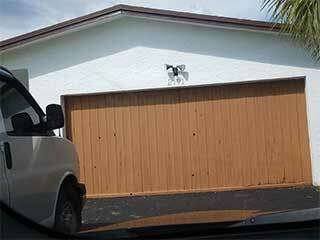 Garage door adjustment, for example, is a vital part. It involves testing the door's balance and adjusting the tension of the springs accordingly to keep them from overstraining or from weakening too quickly. If the door is unbalanced, it won't open evenly and could leave a small gap which will allow pests or burglars to get inside. Our team also checks the force and travel limit of the opener, as well as the unit's main safety features, like the photo eye sensors and the auto-reverse mechanism. It's very important to make sure the sensors are properly aligned and that the door reverses when it needs to, as otherwise your personal safety could be compromised. Our service also includes minor repairs, such as tightening the fasteners and aligning the tracks, and roller lubrication. Since the goal of our team at Garage Door Repair Kissimmee is to extend the lifespan of your system as much as possible, as well as to ensure your safety and to eliminate as many problems as we can, we are fully committed to providing high-quality services. Call us today to schedule an appointment.